Posted on August 30, 2016 by John J. Berger, Ph.D. This is the second of a four-part series on Amsterdam’s efforts to reduce its carbon footprint and become a more sustainable city. 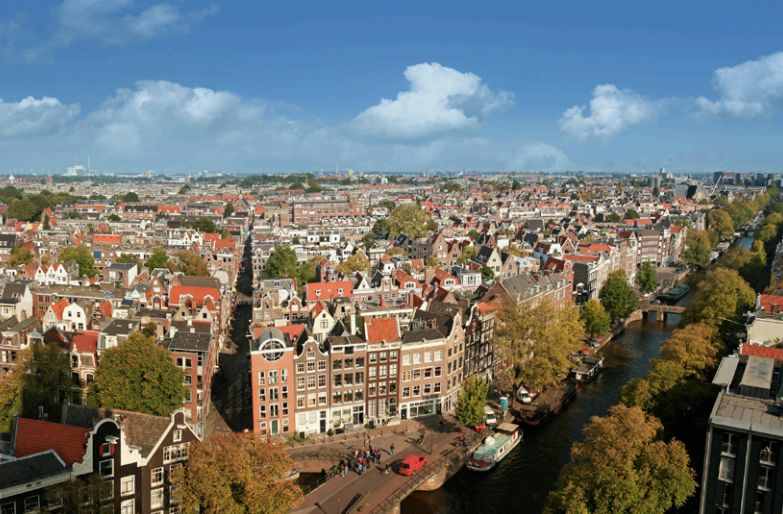 It highlights Amsterdam’s plans to slash its greenhouse gas emissions 75 percent by 2040. Residential and commercial neighborhoods of Amsterdam stretch as far as the eye can see along Prinsengracht, the longest of Amsterdam’s four main canals. Image by International Energy Agency. 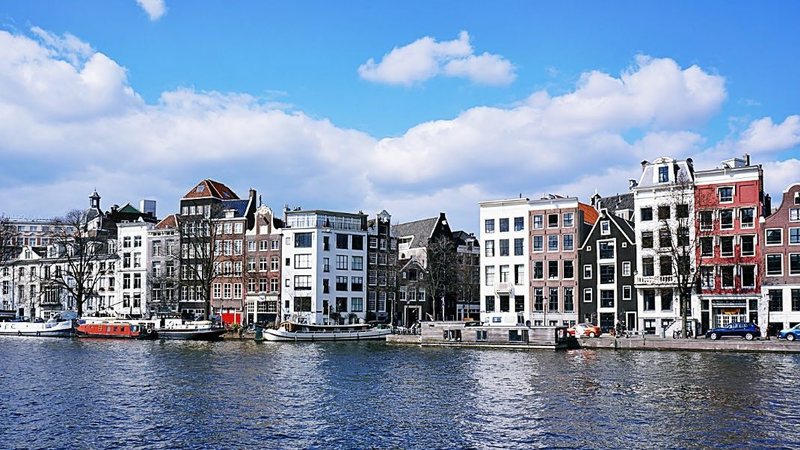 Amsterdam, The Netherlands — Amsterdam has set forth ambitious aspirations to slash its greenhouse gas emissions (GHG). In Amsterdam: A Different Energy: 2040 Energy Strategy (2010), the city outlines its intention to become sustainable by 2040, emitting only a quarter as much GHG as in 1990. If Amsterdam succeeds, its emissions would be 15 percent below the European Union’s 60 percent emissions-reduction goal for 2040. Municipal officials see the city’s 2040 GHG target as a milestone that must be attained if the city is to reach an 80 to 90 percent reduction in GHG by 2050. City leaders have long recognized, however, that achieving the 2050 goal will be a lengthy process requiring broad cooperation as well as patience and perseverance. That’s why city officials have made it a practice for almost a decade to reach out to the business sector, government, and civil society groups to build a broad social consensus in favor of the city’s new energy and climate strategy. What’s especially interesting about Amsterdam’s sustainability vision is the way it integrates economic and social aims with environmental and climate goals. Thus, as Amsterdam plans to phase out fossil fuels to usher in a clean-energy future, the city anticipates that the transition will bring a broad range of co-benefits, rather than unrequited costs. 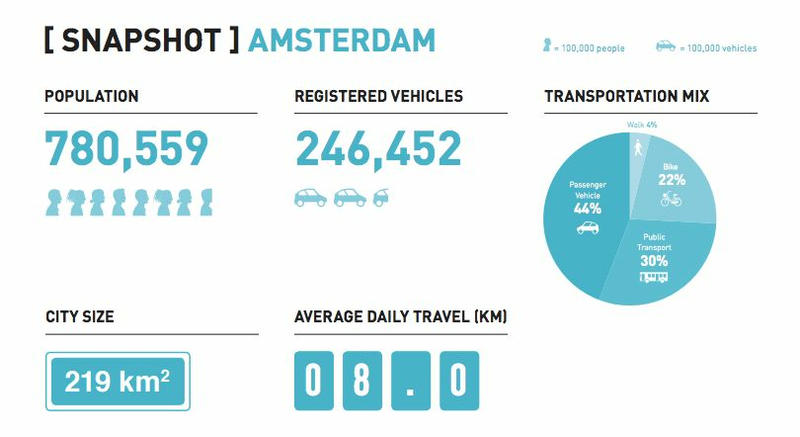 Less than half of Amsterdam’s citizens report a passenger vehicle as their primary mode of transportation. Image by International Energy Agency. That’s because the same steps that Amsterdam must take to reduce and ultimately eliminate fossil fuels will also improve Amsterdam’s air quality, reduce its traffic congestion, make its buildings more comfortable, render its workforce more productive, and save its citizens money. The city’s sustainability vision is panoramic in scope, encompassing the use of public space as well as how energy, water, and material resources can be used more efficiently. For example, the city plans to make greater efforts at recycling urban waste and construction debris. The goal is to more than double today’s recycling rate by separating 65 percent of urban waste by 2020 into resource flows of glass, paper, plastics, and even textiles. Simultaneously, the city plans on becoming more flood-proof with the help of green roofs and better stormwater management. City leaders believe that accomplishing all these goals will make Amsterdam a more prosperous, cleaner, quieter, safer, more pleasant, and more affordable place to live. These improvements will help make Amsterdam a more socially diverse, inclusive, and sustainable city. If successful, city leaders will also reduce both the cost and quantity of energy used per person and the carbon dioxide each inhabitant emits. The move toward sustainability has both an approach and an avoidance dimension. Amsterdam’s leaders are drawn toward a vision of Amsterdam as a clean, prosperous, and sustainable city, while simultaneously wanting to avoid the problems that fossil fuel dependency entails. These include air and water pollution, price volatility, and limited fuel reserves, hence the looming threat of eventual fuel shortages and price increases. Renewable energy, by contrast, is ever-present; virtually nonpolluting during operation, and inherently more predictable in price. In addition, its prices have been dropping steeply for several decades and in many places are at parity or cheaper than new fossil fuel power. 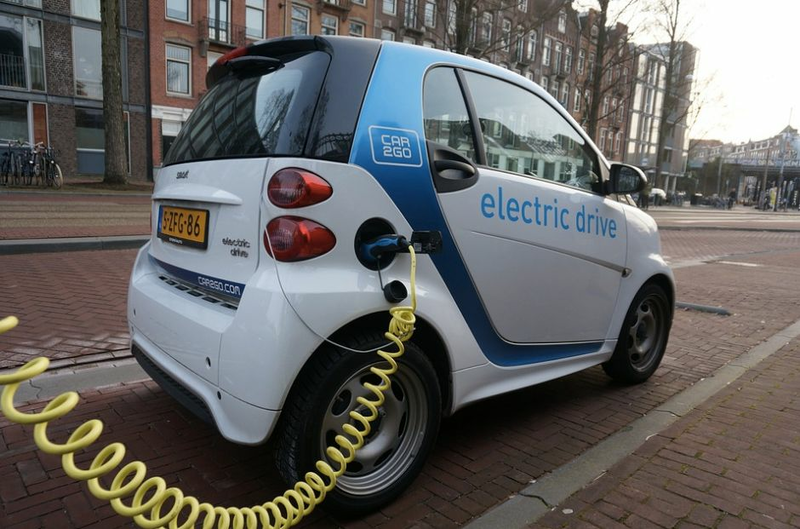 Amsterdam plans to have 4,000 public electric vehicle charging stations by 2018. City leaders foresee that their sustainability plans will thus provide a bulwark against an eventual era of fossil fuel scarcity and higher prices. The Netherlands has been drawing down its once-abundant natural gas supplies for some time now and will have to start importing natural gas by 2025, as will much of the EU. Two additional factors are increasing Dutch political support for renewable energy. In Groningen province, where most of the Netherlands’ natural gas is extracted, gas wells are being blamed for severe earthquakes over the past four years. Historic monuments, including 800-year-old churches, have been damaged, and Groningen residents have demanded a halt to gas production. If that happens, the Netherlands would become more dependent on Russian natural gas, a dependency which is politically unpopular. By reducing the need for fossil fuels, Amsterdammers expect that investments in modern, efficient, clean energy systems will ultimately pay for themselves in energy cost savings for citizens and corporations. They see this as a “win-win” that will render the city more pleasant and healthier in the near-term, while insuring that, in the long-term, future energy supplies stay affordable and predictable in price. Amsterdam’s leaders have also understood that clean air and clean water are essential if the city is to be habitable, sustainable, and attractive to residents and businesses in the future. They know that a clean environment is intrinsically more attractive than a polluted one and that it is not only compatible with economic prosperity, but conducive to it. 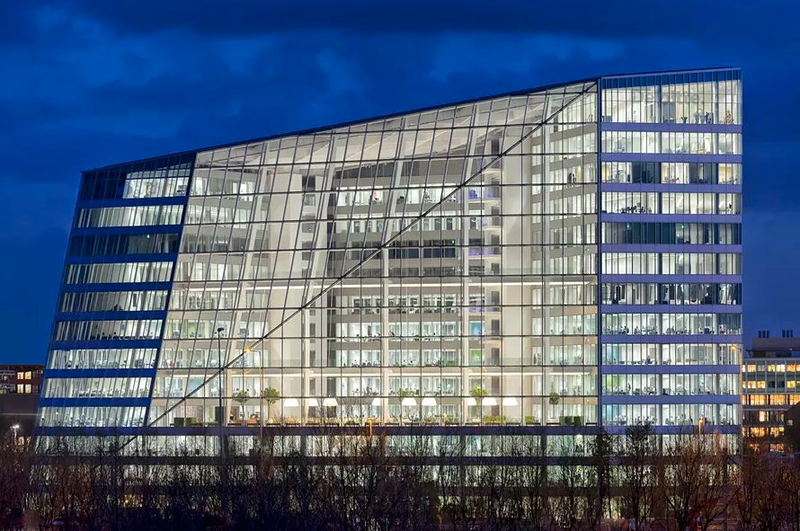 Deloitte Ltd.’s Amsterdam headquarters received the Building Research Establishment’s highest sustainability rating ever for an office building. Image by Ronald Tilleman. Chic, modern, energy-efficient buildings are more pleasant for occupants and command higher prices than older, inefficient units. All else being equal, property values will be higher in a clean, well-managed city with good public transport, compared to a city where public infrastructure has been allowed to decay and fossil fuel industries’ dominance remains unchallenged. The Amsterdam perspective on the economic and lifestyle benefits of a clean-energy transition are in sharp contrast to the view promulgated by people who juxtapose environmental protection against economic growth and attempt to link clean energy with higher energy prices, privation, and economic distress. They therefore plan to mitigate GHG emissions while preparing the city to withstand the inevitable effects of climate change. Posted on August 25, 2016 by John J. Berger, Ph.D.
First of a four-part series on Amsterdam’s efforts to reduce its carbon footprint and become a more sustainable city. Residential neighborhood in Amsterdam adjacent to the Amstel River. Image by Miguel Anaya. Amsterdam, The Netherlands — Knowing that a large and increasing share of global greenhouse gas (GHG) emissions come from cities, and that the world is currently projected to warm 4 degrees Celsius by 2100, if not sooner, it is clearly imperative to reduce cities’ GHG emissions. To get a better understanding of how leading European cities are planning to reduce their GHGs and accommodate to climate change, I traveled to Amsterdam (as well as Rotterdam, Ghent, Copenhagen, and Stockholm) in November 2015 to learn more about their successes and struggles. To achieve its sustainability plans, the city is collaborating and seeking agreements with industries, supply chain managers, real estate developers, and its bus and taxi companies. It has also established a revolving Sustainability Fund of almost €50 million in addition to an existing €40 million in the city’s Climate and Energy Fund. Organizations needing low-interest loans for sustainable energy projects or for waste reuse-and-recovery efforts, can apply to the new fund. Through various programs, the city’s energy and environmental agenda, Sustainable Amsterdam, calls for increasing per person renewable energy production 20 percent from 2013 to 2020 while increasing the city’s installed solar energy capacity from 9 MW to 160 MW and reducing overall per person energy use by 20 percent. 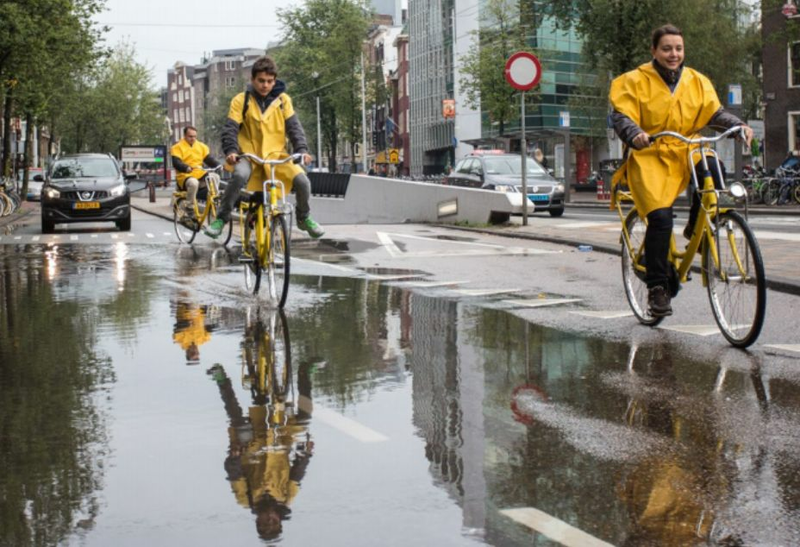 Hardy Amsterdam cyclists navigate puddles in Nieuwezijdskolk, central Amsterdam. Image by Edwin Van Eis. The city is also planning on an 18 MW increase in its installed wind power capacity by 2020―up 27 percent over current levels. (For more on that, watch for “Wind Energy Challenges in the Netherlands,” Huffington Post, forthcoming.) By then, the city plans to improve its air quality by reducing soot emissions by 30 percent and nitrogen dioxide concentrations by 35 percent. While the city is, in general, making good progress on its agenda, some things are somewhat behind schedule. The city government had planned to be energy-neutral by 2015, but hasn’t yet succeeded. After the goal was established in 2007, not enough money was initially allocated to retrofit the hundreds of city-owned buildings (29 percent of municipal CO2-emissions), or replace 110,000 existing streetlights (45 percent of emissions) with dimmable LED-lights. Thus the goal was postponed in 2013. Progress toward the goal has increased since last year, however, and the municipality is now on track to reduce its emissions by 45 percent in 2025 (compared with 2012). The city also had planned to increase its solar generating capacity to 25 MW by 2016 but is only at 16 MW. (That’s still a 78 percent increase over 2013.) And whereas the city was going to drive 2016 per capita energy consumption down by 15 percent, it has only managed to reduce it by six percent relative to 2013. Despite these quibbles, lots of good things are being accomplished in Amsterdam, and many ambitious, innovative programs are underway. To stimulate electric vehicle (EV) demand to reduce air pollution, Amsterdam is increasing the number of its public EV charging stations from 1,000 in 2013 to 4,000 by 2018. (The city currently has 1,900 regular public charging stations and roughly an equal number of private charging points.) There are also fast chargers for taxis. 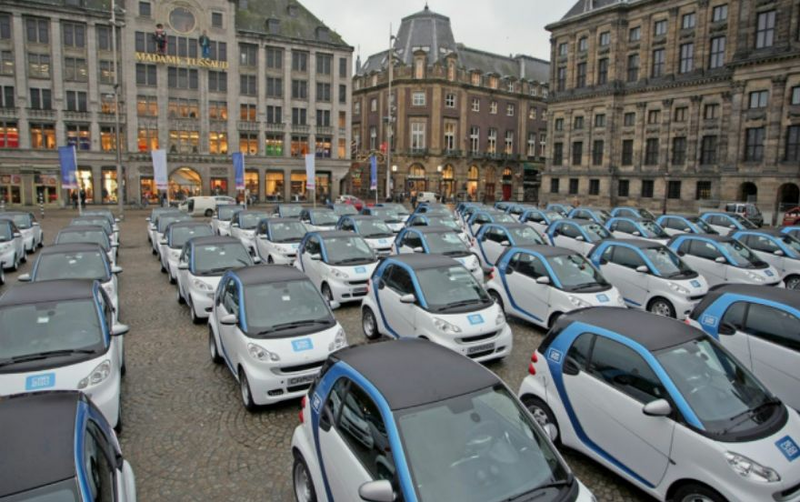 Electric cars fill Dam Square during car2Go’s Amsterdam launch in 2011. Image by Alphons Nieuwenhuis. Vehicle owners in Amsterdam who buy an electric car get a public charging outlet in front of their house, and the city plans to give EV drivers more privileges, such as allowing them to deliver goods to stores during hours when deliveries by fossil-fueled vehicles are restricted. Whereas the city’s taxi and bus companies originally were strongly opposed to the city’s climate and energy program, the city has successfully enlisted the cooperation of both groups. It reached an agreement with its municipal bus company in 2015 to have all-electric bus transport by 2025 and is studying how its municipal ferries can be made cleaner. 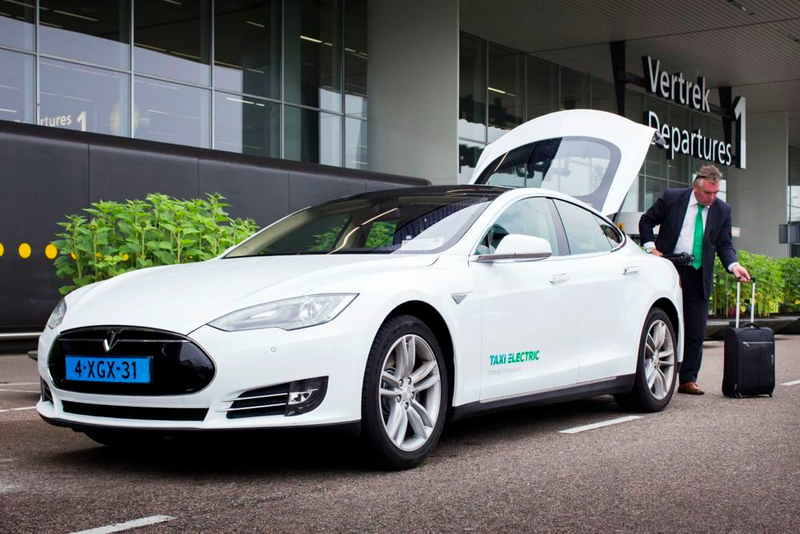 A Tesla Model S taxi picks up a passenger at Schiphol, Amsterdam’s international airport. Image by Schiphol Group. In addition, the hundreds of mostly diesel boats now used for tours through the city’s historic canals have to be electric by 2025. The city also reached an agreement with its taxi fleet: All taxis within the city will have to be electric by 2025 and, during the transition, electric taxis are getting preferential treatment at certain city taxi stands, so they have to wait less for their fares, making the switch to electricity more profitable. As part of a deal with delivery companies, Amsterdam will also increase the number of freight transfer hubs on the outskirts of the city. There, gasoline and diesel-powered commercial vehicles are encouraged to transfer cargo to low-emission or zero-emission vehicles and to combine loads to reduce the number of delivery trucks in the city. Over the seven years from 2013 to 2020, the city intends to increase the number of homes connected to district heating from 62,000 to 102,000 and to provide an €8 million subsidy to one of the city’s public housing corporations to retrofit 1,000 apartments to a zero-net-energy standard. The city hopes that this program will encourage other building owners to follow suit. Amsterdam’s solid waste is burned in an incinerator to produce heat and power for the city. The electricity goes into the grid, and the heat is distributed to residential and industrial customers. Although the plant burns municipal waste, the city is nonetheless seeking to increase the separated percentage of its solid waste from 19 percent in 2013 to 65 percent in 2020. Amsterdam is one of the world’s most politically progressive, socially cohesive, and technologically advanced cities. So the challenges it has encountered in moving toward sustainability should serve as a cautionary tale. Less developed, less well-governed, more fractious societies face far greater obstacles on their paths toward eventual sustainability. Developing nations are increasing their GHG emissions rapidly today, typically at 5-6 percent per year. These countries and their large, rapidly growing cities, tend to be less homogeneous, less affluent, and less orderly than Amsterdam and other Western European capitals. Their challenges will likely be far greater than those Amsterdam has encountered. Posted on April 21, 2016 by John J. Berger, Ph.D. The global climate agreement reached in Paris late in 2015, which sets specific targets nations will aim for in limiting emissions of heat-trapping greenhouse gas, was widely and justly regarded as a diplomatic triumph. But the accord never mentions the cryosphere, the frigid regions that include the planet’s polar ice caps; ice fields; mountain glaciers; and permafrost, or perennially frozen soil. Even if the emission-reduction targets are met, it won’t be enough prevent the cryosphere from thawing, tipping us into the sort of climate the world hasn’t seen in 30-50 million years, and certainly not since humans have existed. The crucial element in this scenario is permafrost, which is like a giant carbon deep-freeze. If we pull the plug on it by allowing it to thaw, plant matter that has been on ice for ages will decompose, and release carbon dioxide or methane or both into the atmosphere. Those gases will trap extra heat and raise global temperatures beyond what our fossil-fuel-based carbon emissions would do on their own. But that official goal is unrealistic. Modeling by independent climate research groups has shown that the pledges outlined in the agreement would actually result in global average temperature gains of 2.7 °C to 3.5 °C by 2100, with an ultimate peak of 3.4 °C to 4.2 °C by the time Earth’s temperature stopped rising. And that doesn’t include the extra carbon now expected to be released from thawing permafrost. New calculations about the likely extent of those releases was simply too recent to incorporate into the accord. “We know that the permafrost contains an enormous amount of carbon,” said Dr. Max Holmes, a senior climate scientist at the Woods Hole Research Center in Falmouth, MA. “Twice as much as in the atmosphere and three times as much as all vegetation on Earth.” The more quickly the carbon emerges, the greater the risk of triggering catastrophic climate change. Models project that 30-70% of the world’s permafrost will thaw this century to a depth of about ten feet. Dr. Sue Natali, a colleague of Dr. Holmes at Woods Hole commented, “It’s going to be a slow release, not an explosion, and it’ll be faster after 2100.” “Once permafrost thaws,” she noted, “there’s no action we can take to stop the release of carbon,” she warned. Unlike temperature changes, cryosphere processes are typically irreversible. Dr. Natali’s concern is underscored by a recent article in Nature Geoscience showing that the permafrost covering up to two-thirds of the terrestrial Arctic is degrading rapidly, causing major landscape and hydrology changes. Meanwhile, a new survey of 98 permafrost experts in Environmental Research Letters indicates that we can’t count on the growth of new plants in the Arctic to offset permafrost carbon releases by absorbing carbon from the atmosphere, as some researchers had optimistically theorized. Instead, the permafrost region will become a source of extra carbon in the atmosphere by 2100, no matter what warming scenario the world follows. On the bright side, the survey concluded that up to 85% of the permafrost-region carbon releases associated with a business-as-usual emissions scenario could be avoided, if net global emissions peaked within a decade or so, reached zero by around 2070, and became negative by 2100. The world’s permafrost stretches across 24 percent of the Arctic and contains 1.5 trillion tons of carbon. The permafrost could release as much as 130-160 billion tons of carbon just between now and 2100, according to a report from the International Cryosphere Climate Initiative (ICC). That would be roughly 100 times the carbon the U.S. annually emits from all fossil fuel and cement production. Unlike emissions from fossil fuel combustion, emissions from thawing permafrost, in the form of methane and carbon dioxide, amplify themselves by causing extra warming that leads to even more thawing. In conjunction with society’s other emissions, the permafrost emissions could therefore lead to an out-of-control, self-reinforcing cycle of warming, thawing, further warming, and so on. When permafrost emissions are included in the global allowable carbon “headroom” budget that the world can still in theory afford to emit and still stay below 2 °C of warming, then according to ICCI permafrost experts, the headroom for human emissions shrinks to only 115 billion tons of carbon, versus the 275 billion tons once presumed. This means we have far less time to adjust our collective greenhouse gas emissions because we can now emit less than half as much additional carbon as we thought. We will have to act faster; transition costs to a clean energy economy will be higher; and our technological options will be fewer. Posted on April 24, 2015 by John J. Berger, Ph.D.
Only 48 percent of the public agreed that global warming is caused mostly by human activities. Even fewer, only 41 percent, agreed that most scientists think global warming is happening. 48 percent were not worried about global warming. Whereas 42 percent agreed that global warming is already harming people in the U.S., only 34 percent agreed that “global warming will harm me personally” (greatly or moderately). 51 percent agreed global warming will harm people in the US during the next 10 years. 35 percent doubted that global warming will harm people in developing countries. The good news is, seventy-seven percent of Americans agree that government should be funding research on renewable energy, and seventy-four percent agree that the government should regulate CO2 as a pollutant. Thus, while many Americans remain ignorant about the causes of global warming and the severity of its impacts, they nonetheless support some policy measures that will help mitigate climate change. Unfortunately, only forty-four percent of Americans favor a revenue-neutral (fully refunded) carbon tax, suggesting that while they support a shift to clean energy, they are unwilling to support any new taxes, even if rebated, that would accelerate the clean energy shift. Posted on April 7, 2015 by John J. Berger, Ph.D.
Three Mile Island – one of Exelon’s more well-known nuclear power plants. In a strategic move to obtain carbon credit payments intended for clean energy sources, a major U.S. nuclear power plant operator is asking public officials in Illinois to allow it sell carbon credits to alleviate its financial woes. Exelon Corp., which operates more nuclear power plants than any other company in the U.S., competes today in its sale of electricity with relatively cheap natural gas. The company says it may have to close three of its plants in Illinois if the state does not change its rules so that Exelon can sell carbon credits to electricity suppliers in the state. That would enable Exelon to indirectly secure ratepayers funds intended to promote the production of truly clean and renewable energy sources like solar, wind, and small hydro. By contrast, nuclear power plants cause carbon emissions during the mining, milling, enrichment, and fabrication of uranium fuel, and they produce highly toxic and carcinogenic radioactive waste in their spent fuel. They also present unique risks of potentially catastrophic core-meltdown accidents from a variety of causes, including equipment malfunctions, operator errors, terrorist sabotage and attack, or natural disasters, such as earthquakes or tsunami’s. Some of these low-probability, high-consequence events have already occurred on a number of occasions throughout the world. In a further contrast to truly clean and sustainable power sources like solar and wind, U.S. nuclear power plants use fuel made with uranium-235, a finite fuel that exists in limited quantities. As high-grade ores are depleted, the costs of mining and milling lower grade supplies increases. Posted on January 19, 2015 by John J. Berger, Ph.D.
COP20, The UN global climate talks that recently concluded in Lima, Peru. This book clearly shows how monumental the challenges are that must be surmounted if we are to protect the climate and insure social justice. BERKELEY, CA—January 19, 2015 – Naomi Klein’s remarkable book This Changes Everything: Capitalism vs. the Climate (Simon & Schuster, 2014) is a deeply insightful and unflinching look at the global threats posed by climate change, environmental devastation, and economic injustice. Klein offers up a new framework for understanding the economic and political roadblocks preventing progress on climate protection and social justice. She does not, however, offer a “one-size-fits-all” solution that will work everywhere around the world. Instead, she points to tactics—like building broad domestic coalitions with strong global ties to Progressive forces abroad—that could lead to the creation of diverse global solutions. Klein’s solutions are best suited to the U.S. and other advanced economies and thus don’t seem to grapple with the problems of burgeoning global population, oil-producing Middle Eastern dictatorships, volatile impoverished nations like Pakistan, and rapidly developing, coal-reliant economic powerhouses like India and China. Today’s economic and climate challenges represent a unique “climate moment,” Klein says, and we must seize it in order to implement sweeping new economic and environmental policies for reorienting humanity’s relationship to the natural resources that sustain life on Earth. This Changes Everything is at its core as much about the redistribution of wealth and power on a planetary scale as well as about the ecocide we’re committing in assailing the climate. Klein thus argues that we must make a revolutionary shift from an unsustainable economic model based on resource extraction and the exploitation of people to a relationship of interconnection and reciprocity with the natural world. Easier said than done. To bring this about, we have to build a broad social movement, she declares. It needs to be founded on basic moral values and ecological principles, rather than those of unfettered free enterprise, profit maximization, and perpetual economic growth. The steps on the path to creating this movement, however, are never clearly laid out. The current climate impasse, Klein says, stems from acceding to the fundamentalist free-market capitalism paradigm, a false ideology rife with deep contradictions. It rests on a counterfactual belief in infinite growth and on the tenets of minimalist passive governance, hostility to regulation, and aversion to public sector investment. That pretty well nails the Tea Party, Libertarians, and today’s Republican Party, many of whom still deny climate science itself, despite overwhelming evidence. Their free-market worldview, she believes, has brought us over the edge of disaster to the brink of catastrophic climate change. Commonsense responses to the climate crisis have been blocked, she tells us, by multinational corporations and other vested interests, especially large energy corporations. So, a core battle of ideas must be fought and won to delegitimize them and their policies before effective massive action to take on global warming can succeed. That means supplanting the free-market paradigm of resource extraction and perpetual growth with a more sustainable model based on resource stewardship and regeneration. But to do that, you need a broad popular movement to curb the influence of corporate money and oligarchic wealth in politics and to force government to regulate corporations and invest in a far-reaching economic transformation. Once you postulate a powerful social movement in the service of climate protection and social justice, the rest of Klein’s long-term agenda begins to seem more feasible, although it ultimately requires a major economic restructuring, lifestyle changes, and a political transformation, as well as policies aimed at reducing consumption—a politically taboo subject. Klein’s solutions also require long-term energy and economic planning with an emphasis on the kind of decentralized renewable energy production that has proven so successful for many farmers and ranchers in Western Europe and the U.S., plus investments in energy efficiency and electric vehicles. She envisions an expansion of the public safety net, carbon taxes, and greater support for infrastructure, including mass transit with electric trains powered by renewable energy. As Klein understands, entrenched vested interests will fight these reforms tooth and claw. Advocacy of job-creating public investment could indeed serve as a nucleus around which a broadly based social movement could begin to coalesce, but whether it could be induced to embrace Klein’s larger agenda is unclear. Naomi Klein addressing a rally. This movement would likely first be dominated by “bread-and-butter” issues. Then smart leadership would need to weave climate concerns into core demands for jobs, higher wages, less inequality, and a better environment. The broad movement could flourish through the implementation of a “Marshall Plan for the Earth,” to which Klein makes a couple of references. Klein has great faith in the activism of indigenous people to block fossil fuel development and inspire broader public opposition. She evidently sees these and other local “pockets of resistance” to fossil fuel encroachment as the yeast from which the broad social movement will arise. Here her argument may be more a leap of faith. These local communities trying to block resource extraction projects don’t have the power to change the U.S. tax code or alter national spending priorities or ram big, New Deal-like social programs through a recalcitrant Congress, all of which must eventually be done to protect the climate. Yet their isolated pitched battles may be like sparks awakening the conscience of a nation, particularly youth and those who live in the urban population centers where political power is concentrated and middle class movements are likely to arise. In any case, brilliant as it is, This Changes Everything never fully explains the step-wise process by which the seeds of resistance are transformed into that vitally necessary mass climate movement so key to Klein’s vision. Klein seems to believe that like lightning striking a mixture of amino acids in a beaker, the recurrence of ever-more serious climate-related disasters will catalyze the creation of the movement. But even huge disasters like Superstorm Sandy and Hurricane Katrina have not yet done so, though they have already clobbered tens of millions of people. If a truly colossal disaster on a gargantuan scale is required to finally empower such a movement, it may by then be too late. John J. Berger, PhD. (http://www.johnjberger.com) is an energy and environmental policy specialist who has produced ten books on climate, energy, and natural resource topics. He is the author of Climate Peril: The Intelligent Reader’s Guide to Understanding the Climate Crisis and Climate Myths: The Campaign Against Climate Science. This article was adapted from two longer articles that appeared recently on Huffington Post and on Communities Digital News.